One of my mentors, in the years before he won his Pulitzer and before he’d finished writing his first novel, said that writing a novel changes your brain chemistry. If he were not fastidiously groomed as usual that day, I would have imagined a grizzled beard and weary eyes based on the tone of his battle weary but proud voice in saying so. I have, in the years since, anticipated and welcomed the change in my brain as I wrote my novel’s first draft. And I *could* feel my brain changing–I wasn’t sure if it was because of the years of work involved and the course of life wending its way alongside the writing, or if it was the writing itself; regardless, I knew the time spent on my novel was changing me. For the better–and for that fact alone, I would still be happy in the completion of my draft, even if it were not published, even if it were not read by anyone else in the world. At times, the writing was slow going, and my brain felt rusty and resistant to change even if I wanted it; what could I do to help my brain accommodate the novel writing? In the world of athletics, athletes stretch to warm up, they consume foods that optimize their physical performance…what could I do to help my writing? After reading Murakami’s book on running (the pleasant What I Talk About When I Talk About Running) , I learned that there is a way to prepare your brain for the landscape of endurance and long distance. According to Haruki Murakami, running is the best training for writing a novel. And so, inspired by Murakami’s statement that “most of what I know about writing I’ve learned through running everyday,” I set out to run, first at an intermittent trot/walk of one mile distance, then working my way up to five kilometers and then beyond. I have never been a runner. Running has had me gasping in pain my whole life, but I wanted to really try. For some people, exercise comes from a motivation to fit into a dress, others are motivated out of a drive to improve health–and I, I discovered, was motivated by a desire to improve my writing, no matter how far-fetched the connection. Plus, I had a hole in my heart that was only recently closed, and I was eager to try out my new heart on my new regimen that would change my brain and my writing. It was not easy at first, this new running regimen, but it WAS easier than I thought it would be. I followed the Couch to 5K plan, which gave me an enormously valuable running structure. There were days I didn’t want to “run” (in the beginning, my “run” was at 4.0 miles per hour, which to most people might be defined as a trot or something slightly faster than a fast walk), but I always felt better after the session than before. Surprisingly, I didn’t find myself gasping for air. My lungs didn’t burn as much as I thought they would. My legs were sore on some days, and not so sore on other days. I was in wonder at my body and at my healed heart. My body began to change. My moods began to stabilize, my energy began to lift. Mostly, I found myself changing the way I think. Because the sessions were not so much about intensity and pain as they were about keeping myself moving forward beyond what I felt was a comfortable amount of time, I kept having to motivate myself to keep going. I began to learn how to think my way through endurance. I don’t think it’s a coincidence that in the year I began to run, I also finished the first draft of a novel manuscript that I’ve started, stopped, restarted, stopped and started again over the span of a few years. My brain learned the act of endurance, of shutting out discomfort, of savoring rhythms and pushing me forward in focused determination. This year, I would like to run at least five miles/session on a regular basis. I think it’s entirely achievable, and I look forward to it, as I wend my way through the revision of my manuscript. I also look forward to changing further and learning new mind/body connections and lessons. While some may think that Murakami means to say that running is an “antidote to the sedentary act and emotional darkness of writing of running sitting on your bum and writing,” I think that running is more a training to ready the writer for the landscape of writing. It has provided me with discipline, routine, health, energy, and it has given my brain tools to push me forward in what is one of the biggest acts of endurance: novel writing. You’re right, there must be something to the rhythms of both. The preparation rituals, the pace of foot to treadmill & finger to key, scheduled time to follow your thoughts down some overlooked corridor. Swimming works well too. It even muffles the ambient noise so that all you get is the sounds of your breathing and each stroke breaking the surface. Running really is a great companion to writing. This post makes me want to get back to it! It’s kind of like meditation, which I’ve always been unsuccessful at doing, but which everyone seems to think is a necessity for a good writing routine. Nate: heh. sometimes I wish a drink could help me write–it’s easier at times, to just pour myself a drink (even though we all know that this is not a “good” longterm writing strategy). I wish I loved swimming, because I can see how wonderful that could be–all rhythm and muffled noise–got a glimpse of what that might be like in that “Lost in Translation” scene. But I hate getting water in my ears. Elizabeth: I think you oughta put your son in one of those special running strollers, and try it out! CLZ: I remember reading somewhere that a writer shouldn’t drink anything stronger than tea. Seems like good advice. Yeah, nice scene. There is the lack of gravity, the smell of the chlorine and the cool water on your skin –all of those sensory inputs place you in a world where only you and your thoughts exist (I feel like there is a word for this place/removal that I am missing). The ear thing is a pretty nasty drawback. That and finding a good pool. Swimming is a lot easier on the hinges though. Maybe I should take swimming lessons to learn proper form. On top of water in my ears, I always end up with a sore neck if I don’t use a snorkel and goggles. I think I must give myself whiplash while turning my head. The scene you described is too alluring! The goggles are still a must, but a sore neck is definitely a “you’re doing it wrong” situation! You glide through the water: niiiiice and eaaaasy –smooooth. It’s pretty easy. You could probably get breathing down in a lesson or two. This post really makes me want to go swimming – I only swim when I’m pregnant, so I haven’t gone for several months – and it really makes me want to read Murakami’s memoir. It’s on my list, but now I wan to read it NOW. (This is why I want an e-reader so satisfy my “I want to read that NOW” urges.) I’ve been running, too, as you know, and it gives me so much energy, but I hadn’t thought about how it will affect my writing. I hope it does for my revision what it did for your first draft. And 5m is totally doable! Join DailyMile.com! Great post. I have his book sitting right here — a friend mailed it to me yesterday! Can’t wait to get to it. Meghan: I’m going to check out DailyMile.com–I wish I could swim well but my form or something is all messed up. I even have a swimming pool, which makes my wish all the more urgent. 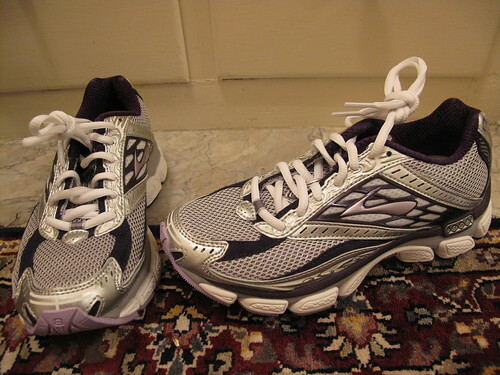 As for my running shoes: that’s a picture of my BRAND new running shoes!!!! I’ve been thinking of running outdoors, because it seems other runners really pupu the treadmill, but I hate the thought of ruining my already creaky knees.